We need space, so we have a few Metropolitan and Amber Road frames on sale. All frames include a fork. The ultimate all weather commuting bikes. Forget about keeping a drive chain clean and lubricated while commuting on salted winter roads. The Gates drive needs no lubrication, and outlasts steel drive chains. 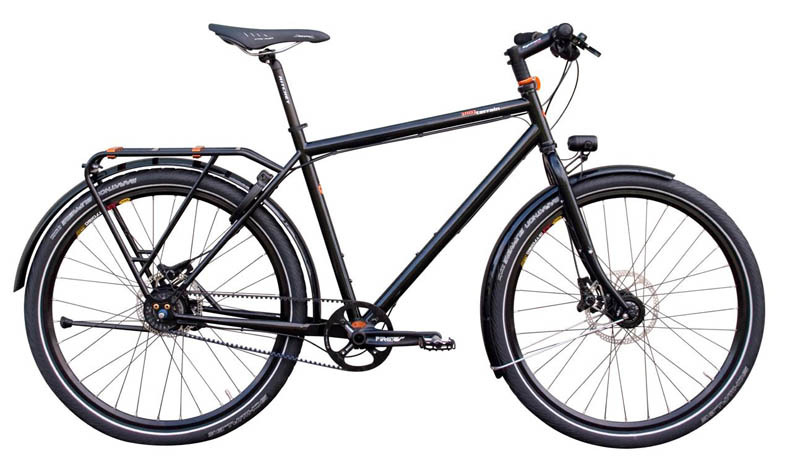 The Metropolitan is the 26" version; the Amber Road is essentially the same bike, but built for 700c wheels. They both accept 2" wide tires, so you're set for those pesky pot-holes in Boston. We stock the Metropolitan in both Bronze and black. The Amber Road is available in what Tout Terrain calls "Olea", or what I would call Olive. Here is our demo Amber Road, size Large, equipped with Rohloff 14 speed hub and dynamo lighting. Here's the Metro in brown or "bronze". This photo is a fairly accurate representation of the brown paint. 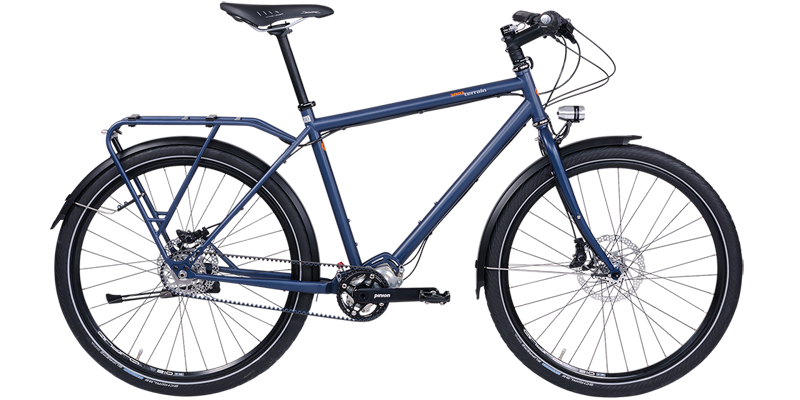 The Metropolitan Xplore is basically the same as the Metropolitan, but instead of an internally geared rear hub, it uses the amazing 18 speed Pinion drive. These are in stock as of July, 2014. 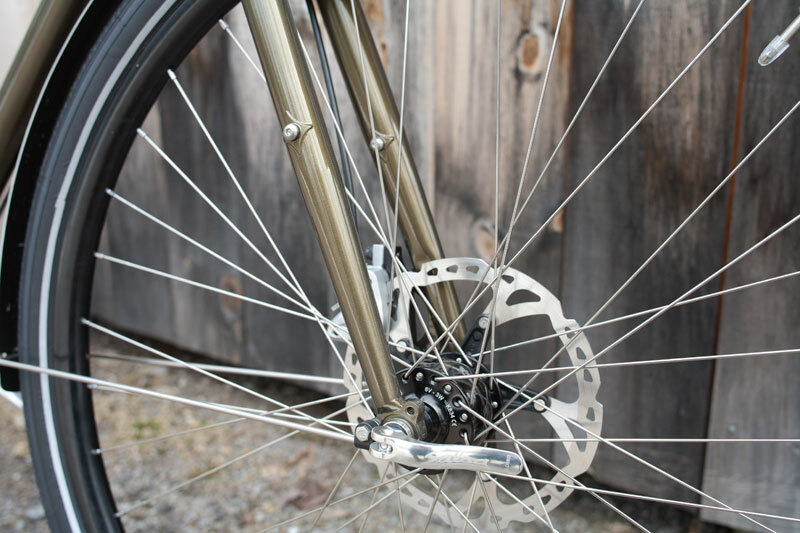 Like all Tout Terrain bikes, the Metropolitan & Amber Road are built for disc brakes. 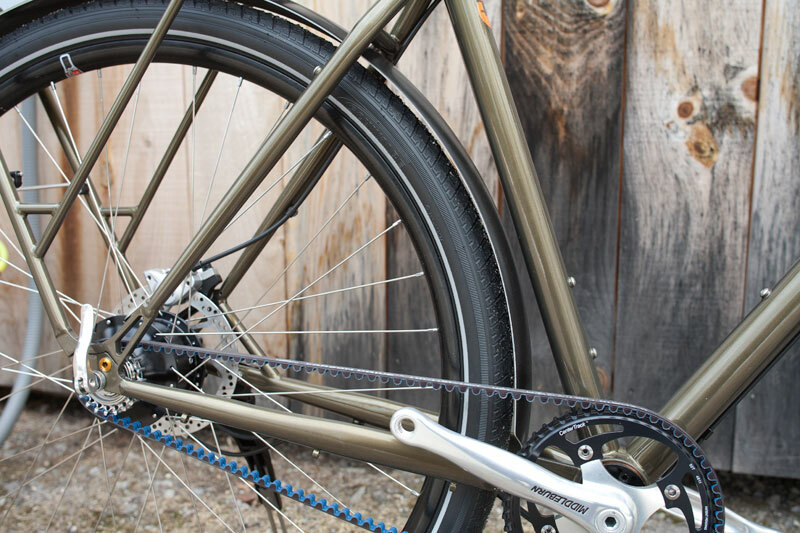 The rear rack is an integral part of the frame, making it extremely rigid and saving weight. 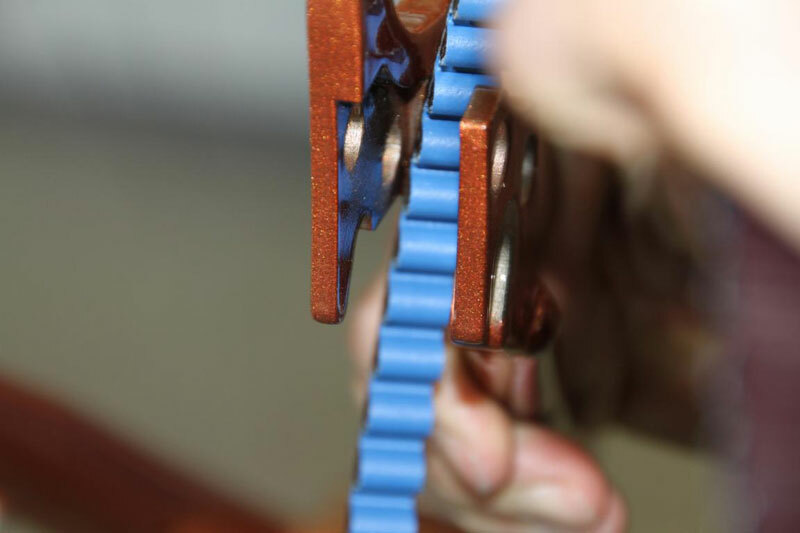 Tension on the drive belt is adjusted via an eccentric bottom bracket shell. 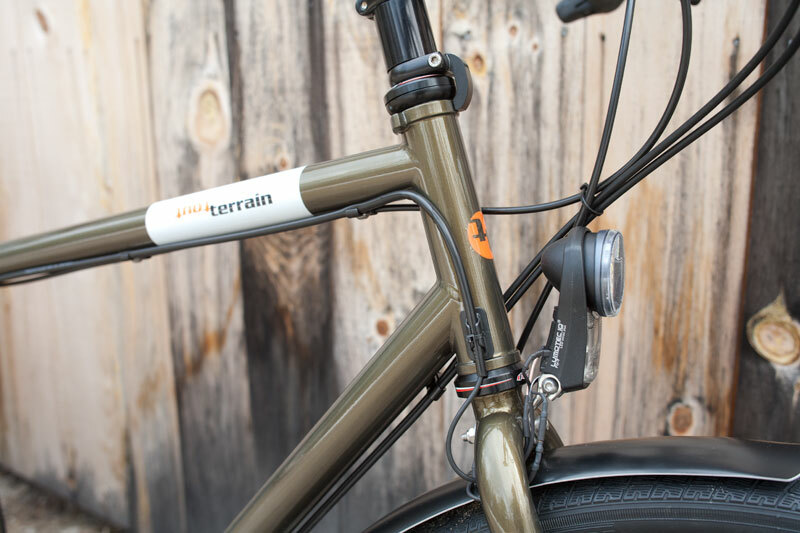 The frame is designed for dynamo powered lights, so routing wires is easy, even through the rear rack to where the taillight is mounted. Here's the Tout Terrain Blade fork, with the Schmidt SON 28 SL hub. No need to plug or unplug wires when taking the wheel on and off. The electrical connections are all made automatically via the dropouts. 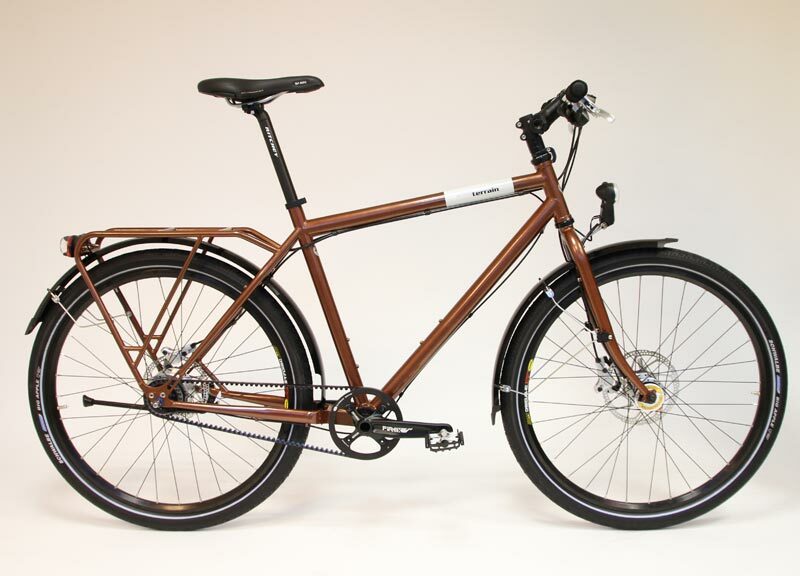 The Blade fork is an option on the Metropolitan and Amber Road bicycles. The headlight is mounted right above the front wheel, for an optimum beam pattern on the road ahead. And the headlight can't hit the downtube by turning the handlebar too far, since both frames incorporate Tout Terrain's exclusive handlebar stop. The fork can't rotate more than 90 degrees in either direction, protecting both the headlight and the downtube. 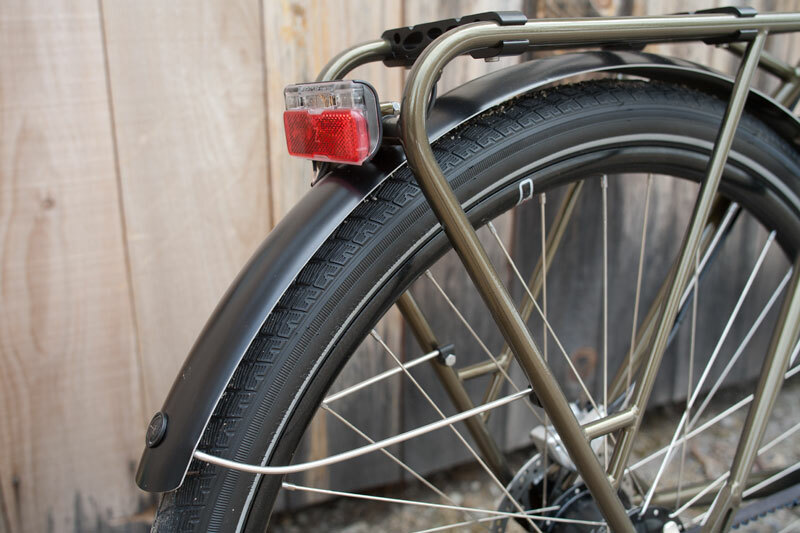 Here's the rear rack section of the Amber Road with a Busch & Müller Toplight Line Brake Plus taillight mounted. Also note the black mounts on top for Racktime bags. If you're using other bags, these mounts can easily be removed. The color in the photo below is not the brown in the production frames. This photo was of a prototype. 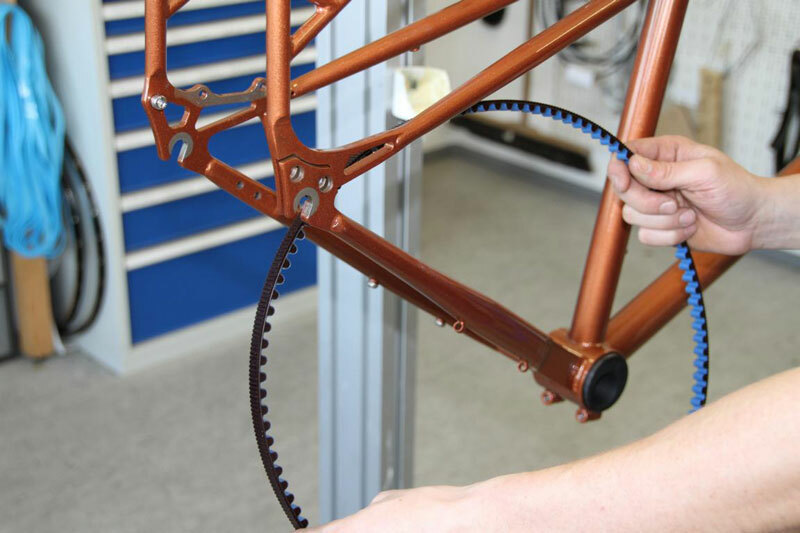 To use the Gates belt drive the frame must have an opening for the belt so it can loop through the rear triangle. Tout Terrain does this at the rear dropout. 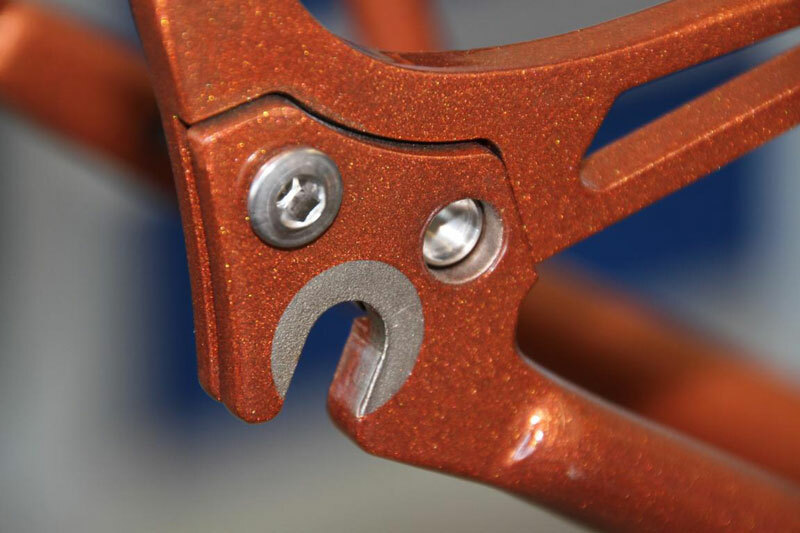 The outer surface of the dropout is part of the chainstay, and the inner surface is part of the seatstay and rear rack. The two parts are then bolted together at the dropout. Feeding the belt through the split dropout. You can buy the frame and matching fork alone, or as a kit or as a complete bicycle. These frames have the appropriate braze-ons for both Rohloff and Shimano Alfine internal hubs. We have the Schmidt SON28 dynamo hub for ISO or Centerlock disc, SONdelux Disc for Centerlock discs, or the Shimano Alfine dynamo hub for Centerlock disc available, as well as a wide assortment of headlights from Busch & Müller, Wilfried Schmidt, Spanninga and Supernova. If you choose the Schmidt SON28 SL hub, it's available in ISO disc only. Whatever Schmidt hub you pick, you can have it polished, black or red anodized. The red is a perfect color match for the Rohloff red anodized hub. We have a few older Metropolitan frames for Rohloff or Alfine hubs which have forks which are not compatible with the SON SL front dynamo hubs. These frames are on sale. Dimensionally, the forks used for the Metropolitan and the Amber Road are the same. With the Metropolitan frame, the fork is used with a spacer under the crown which holds the fender in the proper location with 26" wheels. For use with the Amber Road's 700c tires, you don't use the spacer. The Schmidt SL fork can be used with either the Metropolitan or the Amber Road. We'll provide a spacer if you're using it with the Metropolitan. Complete bicycle with lights can cost from $3300 to $5500, depending on your choice of components. Shimano Alfine dynamo hub and 8 speed rear hub, halogen headlight, Ritchey headset, etc. is about $3300, Rohloff rear hub, Schmidt dynamo, Supernova or Schmidt lights, Chris King headset, etc. is at the high end. I have a spreadsheet with many options for the Metropolitan. Assemble your own quote. Please send an email requesting the spreadsheet and I'll reply ASAP. This spreadsheet has specs for several Tout Terrain models. Be sure to click on the "Metropolitan" tab to see the Metropolitan specs, or the Amber Road tab for the Amber Road specs. Most options are the same for either model, except for rims, tires and fenders.